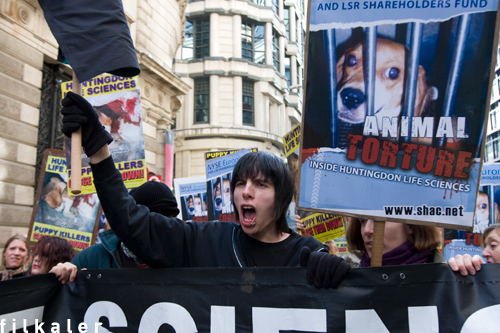 This week it was announced Barclays and four other large investors dropped all shares in Huntingdon Life Sciences (HLS), Europe’s largest and most exposed vivisection laboratory. LSR stock owned by institutional shareholders has now fallen to 12%, placing HLS $4 million below the NYSE minimum listing standard for market value (the only stock exchange listing the company, a major target in the campaign to close HLS). Following a legal challenge against the CEO’s proposal to purchase all of the outstanding LSR stock, an intense global campaign and recent repression against SHAC in Birmingham, a total of 797,284 shares have now been sold. Barclays Global Investors, Barclays Plc, Hartford Investment Management Company, Rice Hall James and Associates LLC, Bank of New York Mellon and Wells Fargo sold all their shares, of which over 400,000 were held by previously largest shareholder Barclays. 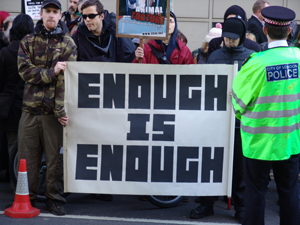 Since HLS’ largest investors dumped all shares in July 2008 (1 | 2), Barclays have attracted hundreds of protests in London, Hampshire, Birmingham, Cambridge, Yorkshire, Tamworth, Manchester, Coventry, Carlisle, Luton, Worcester, Liverpool, Durham, Dublin, Glasgow, Europe and home demos against executives in the US. Furthermore, Animal Liberation Front (ALF) and anonymous activists claimed over thirty sabotage actions across the UK including dozens of cashpoints glued, banks painted and a home visit for Barclays Chairman in Hampshire. paragraphs into the main article body? Nice one for changing the google link to scroogle, much appreciated. Have put in a pic from a shac demo which I think stands out well, not that your suggestions weren’t good. Cheers for helping to improve. Nice one, feature’s looking good. When shall we publish?